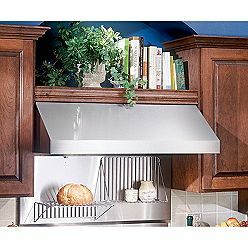 The appliance of the week is the Kenmore Elite 30" Range Hood 54800. The Kenmore Elite 54800 comes in stainless steel only, mainly because it has a more commercial/industrial design that doesn't lend itself to colors. The exterior has no logo, giving it a professional appearance, but it is not out-of-place in a non-professional kitchen. This hood is designed to be vented out of the home, and cannot be set to recirculate. Make sure you take this into consideration, as it is critical to being able to install and use it. A powerful centrifugal fan generates up to 460 CFM at a modest 10.5 sones when ducted vertically; it reaches an even stronger 500 CFM and slightly quieter 10 sones when ducted horizontally. As a result of this powerful suction, it is recommended that the 54800 be installed at least 24 inches above the cooktop. Heat Sentry detects excessive heat and sets the fan to HIGH to compensate. There are variable speeds as well as memory to remember the last setting that was used. Not only does the Kenmore Elite 54800 range hood have two halogen lights for illuminating the cooking area, but it also sports two heat lamps to keep foods warm (bulbs not included). How's that for convenience? If you're looking to replace an old hood or upgrade your kitchen's appliances, and you'd prefer a dedicated hood rather than a microwave-hood combo above the range or cooktop, give the Kenmore Elite 30" range hood 54800 a look. It's got the looks, the power, and the features to bring your kitchen to the next level.